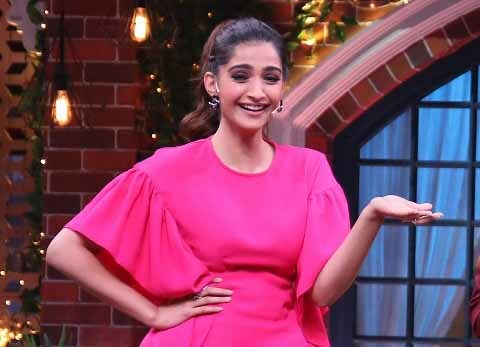 The coming weekend will see the cast of Ek Ladki Ko Dekha To Aisa Laga including Anil Kapoor, Sonam Kapoor, Juhi Chawla, Rajkummar Rao grace the sets of The Kapil Sharma Show. The show has instantly become one of the favorite shows and viewers are not able to contain their excitement of seeing India’s most loved comedian Kapil Sharma back on their TV screens. The episode promises to be a laughter riot as all the guests unleash their hilarious side and elevate the humor quotient. It’s not a hidden fact that Kapil apart from being a comedian is also a brilliant singer and during breaks he keeps the audience entertained with his singing. Singing along with him this weekend, will be the beautiful actress Juhi Chawla who once aspired to become a singer but eventually ended up becoming an actress. Anil Kapoor who will be making an appearance with his daughter Sonam Kapoor had a blast shooting with Kapil and his team. Kapil in his usual inquisitive self, asked Anil Kapoor if he too went on a groom hunt for Sonam to which he said he never did. Sonam further adds that she had met Anand first and only when she was convinced about him and both she and Anand had decided that they want to get married is when they told their respective families about it. Sonam further shares a hilarious moment from her wedding of the “joote chupane ki rasam’ where she recalls that how her very good friend from the industry Swara Bhaskar had planned this entire activity of hiding Anand’s shoes but then Anand had outsmarted her and kept his brother’s shoes in place of his own. Though Swara failed in this exercise but she did manage to get money out of Anand as shagun.